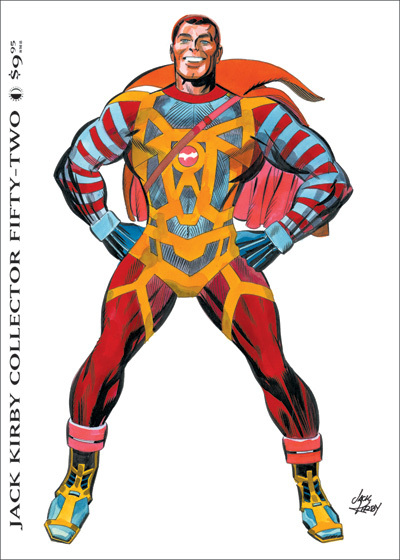 After way too many weeks of struggling with it, the new Jack Kirby Collector (#52) is off to press, and the Digital Edition is already posted for downloading. This was one of the hardest to produce yet, due mainly to one article in it about an unused Thor story by Jack. I spent countless hours working on it, which is why blog posts have been missing here the last few weeks. But I’m back in the saddle again, and looking forward to a couple of Kirby-less weeks to recover, before it’s on to #53. And see that awesome cover image by Kirby? I’ve been searching for that one since about 1995, when I first saw it in the background of a photo of Jack appearing at a comic convention. It finally turned up (compliments of Jack’s grandson Jeremy Kirby; thanks, Jeremy! ), and I’m especially proud to be able to finally present it as a cover. That image was one of two Kirby art items that I swore I’d have to track down before I could stop doing the Kirby Collector (or die, whichever came first). The other? Any page from Jack’s original version of Spider-Man, which Stan Lee rejected before turning the project over to Steve Ditko to draw. If you happen to be in possession of a copy or scan of any of that, make my dream come true and send it in, okay? I’ll give a lifetime subscription to ALL our mags, to anyone who sends it! This entry was posted in TNT on 26 March 2009 by Mr. Morrow. The piece is preceded by a short commercial and a spotlight on another website that helps you locate a restroom when you travel (which I hope isn’t an indicator of the quality of our books 🙂 ), but the TwoMorrows piece starts about halfway through, in case you want to fast-forward it. Thanks, Kirk; we appreciate the plug! I knew it was bound to happen, but more and more I’ve getting wind of Bit Torrent sites that are posting complete digital versions of our copyrighted books and magazines, for anyone to download for free. If you’re one of the culprits out there, robbing from the rich and giving to the poor (or at least deluding yourself into believing that), let me clarify things for you. If you’re illegally posting or downloading copyrighted material (ours or anyone else’s), you’re hurting the very companies whose work you seem to enjoy enough to spend the time stealing. And make no mistake; if you’re not paying for it, you’re stealing it. You can try to justify it, but there’s simply no real justification for it. You are taking money out of the pockets of our editors and authors, and comic shop owners, and hurting TwoMorrows’ bottom line. Particularly in this unstable economy, with sales dropping for all publishers across the board, every sale we lose to a free torrent download hurts really badly, and jeopordizes our future. If you enjoy, say, the Modern Masters books, support us. Tell your friends about them, and buy a copy for yourself. And if you have downloaded a copy, do the right thing; go out and purchase the print edition. But please don’t give away our hard work. When our sales erode due to these torrents, the end result is we simply won’t be able to keep publishingâ€”we’ll be out of business. We’re not some giant corporation with deep pockets, who can absorb these losses. We’re a small company, with dozens of hard working creators, slaving away day and night and on weekends, to make a pretty minimal amount of income for all this hard work. Don’t rob us of the small amount of compensation we’re already getting. Doing so just ensures there won’t be any future products to download. This entry was posted in TNT on 10 March 2009 by Mr. Morrow. 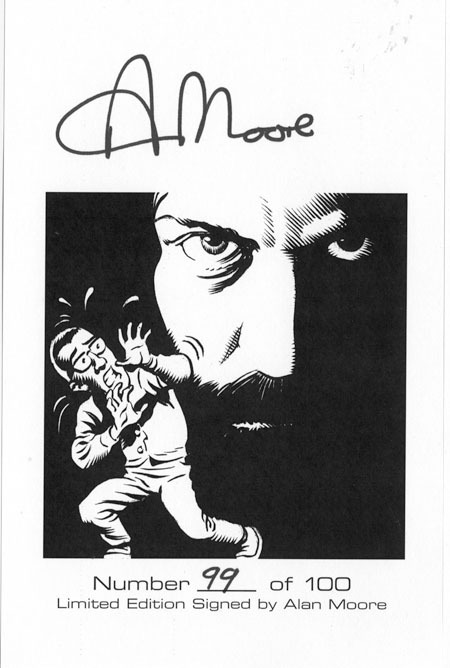 Get’cha Alan Moore autograph (for charity)! The auction runs through 9:30 PM Eastern Standard Time on Thursday, March 12, 2009. Alan was so generous with his time on the production of our book, and with signing 100 copies of the hardcover for us. So George Khoury and I felt this might be a nice way to give a little back to the industry as well. Since Alan doesn’t attend comic conventions, hopefully the relative scarcity of his autograph, mixed with all the hubbub from the film, will carry over and raise some funds for a really worthy cause. This is #99 of our 100-copy autographed limited hardcover edition, which is the definitive autobiographical book on Moore, in which he reflects on his life and work in an insightful and candid fashion through an extensive series of interviews about his entire legendary career, including new interviews covering his career since the original edition of this book was published in 2003 (where Moore, for the first time, goes into detail about why he distances himself from Hollywood’s adaptations of his work). From Swamp Thing, V For Vendetta, and Watchmen to the future of The League of Extraordinary Gentlemen and beyond â€“ all of his most important works and major themes are discussed. Also included are rare strips, scripts, artwork, and photographs of the author, most never published elsewhere, and best-selling author Neil Gaiman headlines a series of tribute comic strips featuring many of Mooreâ€™s closest collaborators elaborating on their relationship with the writer. Included as well is a color section, featuring the rare Moore story â€œThe Riddle of the Recalcitrant Refuseâ€ (newly remastered, and starring Mr. Monster, with art by Michael T. Gilbert), plus his unseen work on Judge Dredd, and other tales. The book is edited by George Khoury, with a cover by Dave McKean, and includes a numbered art plate, personally signed by Alan Moore. So get to bidding already! This entry was posted in TNT on 5 March 2009 by Mr. Morrow.